On a cool March morning, I made my way to the Anaheim Convention Center for one of my favorite Cons of the year, WonderCon! As I approached the esplanade where all the food trucks were in the throes of last minute prep, I couldn't help but notice a twelve foot tall Autobot in their midst. To promote the soon to be released Blu-Ray of Bumblebee, if you posed with the statue of Bumblebee and uploaded it to social media, you were given a yellow backpack and car charger. Free swag and I'm not even inside yet! Upon entering, I had to pick up my wristband for a DC comics signing. I was finally going to get Jim Lee, Alex Sinclair and Scott Williams to sign my copy of Hush later on in the afternoon. My next stop was to see our friends at the Golden Apple Comics booth and play their latest spin and win game. For $1, I spun and won exactly what I wanted which was the trade paperback of Adventure Van Vol.1 by Michael McMillian. Soon enough, it was time to line up for the DC comics signing. As I waited, free comic books were being handed out. Sweet! And none of them I currently owned either. The line was slow moving but eventually I was able to get my book signed. I can finally cross this off my comic book bucket list. The big event of the day for me was the 20th Century Fox panel for Dark Phoenix. Director Simon Kinburg, Sophie Turner and several other members of the cast were present to screen ten minutes of exclusive footage for us. Most of this was scenes not seen in any of the trailers. What impressed me the most was how much of the film involved practical effects. This is set up to be the darkest (no pun intended) of all the X-Men films we've seen thus far. As an added bonus, we all received a pretty sweet mini poster. Next up, I had to hustle to make the panel for the live recording of The 4:30 Movie podcast. If you're not familiar with this, it's hosted by a group of TV and movie writers and producers who curate a theme week of television movie programming. Seeing as how Disneyland is right next to the convention center, the theme was Walt Disney Week. You can find more information about the podcast [here]. They are free to download as well as short and easy to listen to. Finally, I ended day one with a panel looking at the 30th anniversary of Back to the Future Part II. The main focus was discussing how originally the movie was planned as a three hour epic before it was split into parts II and III. Also discussed were plot points and story lines that were discarded along the way. For example, Doc and Marty would have wound up in the 1960's at one point, at the beginning of the counterculture movement. Saturday began with a look at the much maligned Star Trek V: The Final Frontier in celebration of the film's 30th anniversary. Hosted by the Inglorious Treksperts podcast team of Mark A. Altman and Daren Dochterman along with special guest David Loughery, the screenwriter of the film delved into the history of what is considered the worst of the Trek films. Loughery had a lot of little known behind the scenes information about the production. The biggest WTF for me was that while it was widely known that Leonard Nimoy almost didn't return to the role of Spock, Paramount Pictures almost recast the iconic role. Two of the names considered were James Coburn and Martin Landau! Yes, that blew my mind, too. As the budget was slashed and the script became more and more compromised, it eventually morphed into the film we know today. Loughery harbors no ill will though, he just lamented that the script was something rather unique and it was just disappointing to see what was ultimately released. The next panel I saw was for Legendary Comics' Godzilla: Secrets of the Monsterverse. 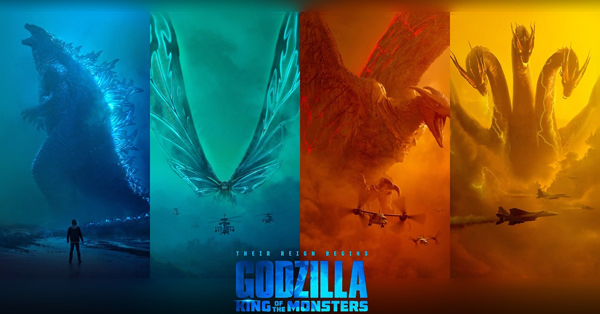 I am a big fan of Godzilla and am looking forward to the soon to be released sequel, Godzilla: King of the Monsters. On May 21st, the week before the film opens in theaters, there will be a prequel comic, Godzilla: Aftershock. This book will bridge the gap between the two films and hopefully answer a question or two posed in the film. We were treated to a look at some of the concept artwork courtesy of the creative team and were given a pretty sweet glow in the dark pin. The big surprise was that the director of the film, Michael Dougherty made a surprise appearance. No spoilers of course but he did tell us that if we were planning on attending the WB/New Line presentation later today, we'd be treated to five minutes of never before seen footage of the film. I was already planning on attending so this just made me even more excited. I took the chance to ask the question if there would be any tease or reference to Godzooky in the film. (For those unaware, he is Godzilla's nephew.) I had to laugh when Dougherty answered most emphatically, 'NO!' Oh well, I tried. He did tell us though that there is a cameo from a character from Kong: Skull Island that so far has been unseen in any of the trailers. Yet another tease for the next film in the series, Godzilla Vs. Kong. 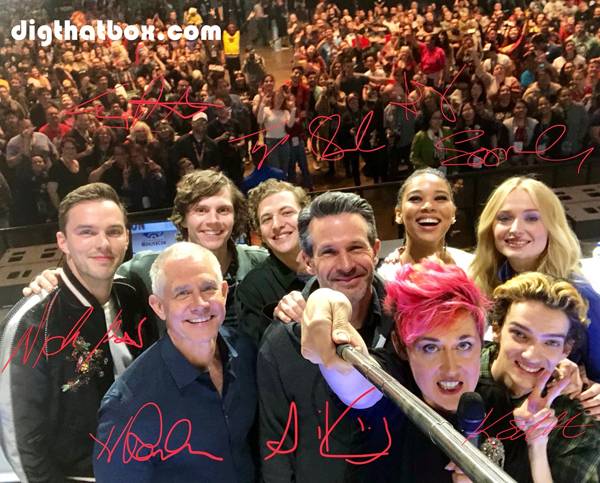 Finally, Shazam himself, Zach Levi was on hand with several other cast members for a look at the next big superhero film to hit theaters, SHAZAM! I will admit that I have been somewhat skeptical of this project, having not known Levi from anything and not much a fan of the character. But after watching the exclusive footage screened for us, I am sold. It looks light and fun unlike most of the other films in the DCEU pantheon. I'm predicting an after credits scene where The Rock makes his debut as Black Adam. Soon we'll know if I'm right. There was only one panel I checked out on Sunday and it was definitely one of the more unique panels I've sat through: Lawyers Go Batty Over the World's Greatest Detective from Gotham. Essentially, the panel consisted of lawyers debating and answering questions about Batman using real world laws. For instance, can Batman be accused of child endangerment, with regards to Robin? Was it reckless for Batman to drive on rooftops in Batman Begins? How does the G.C.P.D. get away with deputizing Batman in the 1966 film without violating the Constitution? Each of the four attorneys present would take on a question and present it in legal terms with a dash of added humor. I didn't have much time on the exhibit floor today but I knew that Sunday was my day to peruse and shop. I first took my time roaming through Artist Alley where I purchased a sweet Star Wars print from Tom Hodges. I then revisited a few vendors I had first noticed on Friday while looking for some good deals on comic books. I've been trying to complete my Batman/Jason Todd collection for a few years now and was able to add nine more issues for less than sixty dollars. I also found a great deal on some DC Legion of Collectors action figures. I added Raven and Nightwing for only five dollars each. All in all, I made out with some great deals. As the day ended, I made my way out, arms weighed down with comics and a smile on my face. About the Author: Abel S. Pinedo a.k.a. "Honest Abe" has written reviews for Dark Horizons, JoBlo and MusicTap. He has worked in the entertainment industry for over a decade. He can usually be found at his keyboard ranting and rambling about the human condition or watching Beavis & Butthead.